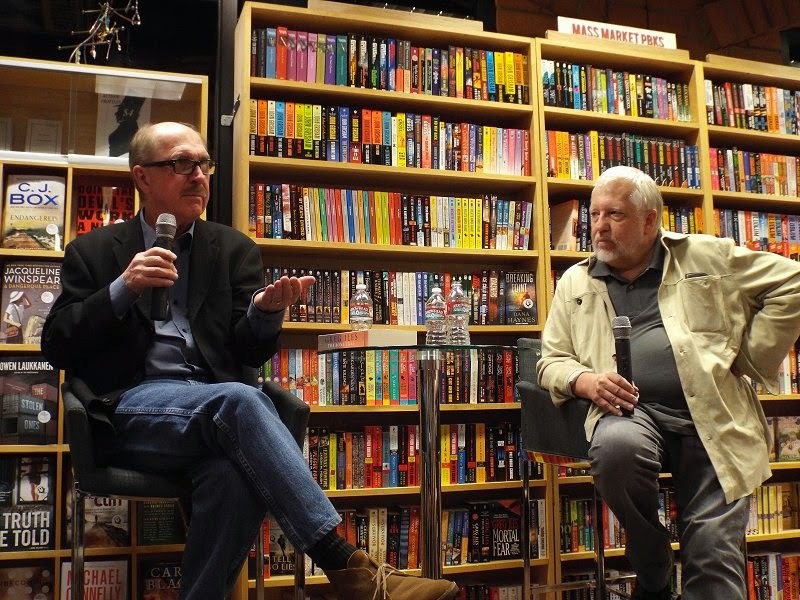 David Morrell and Dan Simmons at The Poisoned Pen! 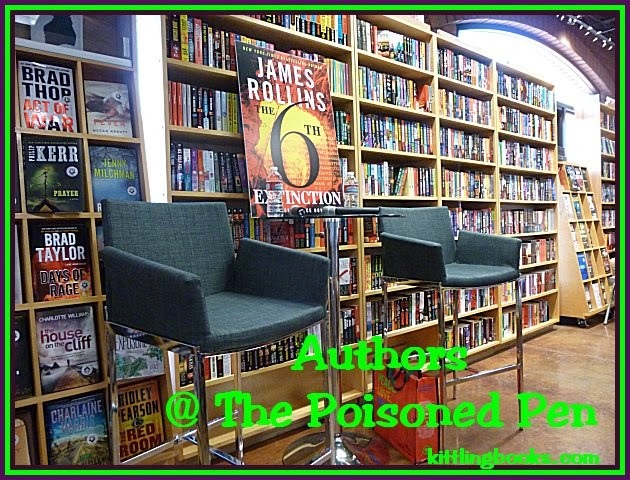 Having been lost in Victorian London with Thomas de Quincey for the past few days in David Morrell's Murder as a Fine Art, I got into the car with a great deal of anticipation for the event at my favorite bookstore, The Poisoned Pen. Since Morrell was appearing jointly with Dan Simmons, I knew Denis and I would have to get there in plenty of time to get preferred seating. We did. I reserved our seats and then set off to do some browsing. When do I NOT buy books at The Poisoned Pen? I finally made myself stop reading and head for my designated folding chair, and well before the event was scheduled to start, the staff of The Poisoned Pen was busily putting out more chairs. "I've been trying to do this for twenty years!" "I've been trying to get David and Dan here on the same day for twenty years!" host Barbara Peters told us as the event began. 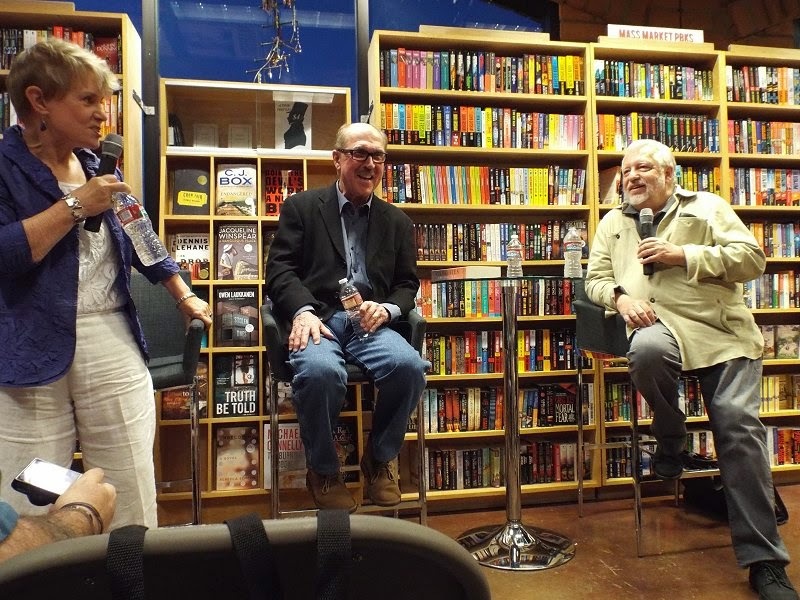 "Finally all the stars aligned, and they're here this evening, which is marvelous since they've both written Victorian noir-- although I'm not sure you could call these books noir." Both authors admitted that they preferred to call their books Victorian thrillers. "David, you've reinvented yourself with these last two books about Thomas de Quincey. Dan, you've written a book which has Henry James as a main character. I have to admit that Henry James is one of my least favorite authors!" Both men looked at her in mock dismay, and I just knew that they were going to tease Barbara about this for the rest of the evening. Barbara continued, "Dan, you reinvent yourself with every book." Dan laughed and said, "I think some of my readers would word that differently. They feel that I build this readership very carefully and then abandon them. Which is true in a way because I get bored with one kind of book and have to move on. I've been very lucky that most of my readers have followed me." The first book Morrell had published contained a certain character named Rambo. His Thomas de Quincey books are quite a departure. 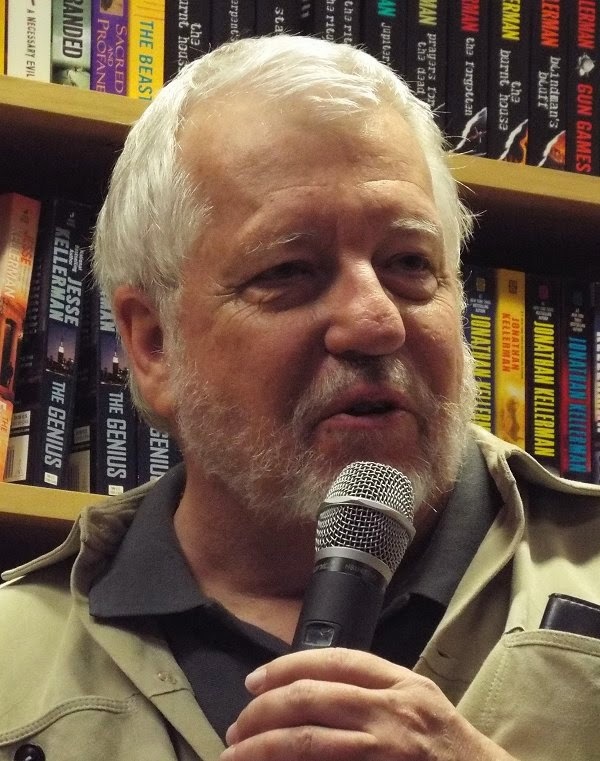 Simmons himself has won many awards in many different categories for his books. "...how close I could get fact and fiction together." "Having mentioned your versatility," Barbara said, "I want to know how difficult it is to write fiction with real people as characters." Dan deferred to David on this question. "I wanted to see how close I could get fact and fiction together," Morrell said. "Seventy years before Freud, Thomas de Quincey developed the theory of psychoanalysis. In fact he invented the word subconscious. We know that Freud read de Quincey's work in Baudelaire's French translation. "Due to de Quincey's opium addiction, he would have nightmares and upon waking he began to wonder where these dreams came from and concluded that the human mind was filled with 'chasms and abysses, layer upon layer, in which there are secret chambers where alien natures can hide undetected.' And when I read this, I went crazy. I saw a chance to have a real guy working in the 1850s with Scotland Yard. The idea was to have Scotland Yard work with the physical stuff and in would walk de Quincey talking about his reality of the mind. Scotland Yard would wonder what he was talking about, but de Quincey would wind up saving the day." Thomas de Quincey wrote thousands and thousands of pages ("brilliant stuff"), and Morrell read and re-read these pages until one of his publishers felt he was channeling de Quincey, or had become his ventriloquist. Morrell wanted to be able to make readers believe that they were in London in 1855. "It took years and years of research to be able to do this." Dan Simmons said, "I have to tell you that your newest book has the most chilling human ventriloquist scene that I've ever read. "With me, I have these scads of historical characters, some of whom I describe in great depth while others I just have to make sure they really were where I say they are. I never have an historical character say something important that he or she didn't actually say." Morrell then swept us all to Victorian London with its easy availability of laudanum, a mixture of 10% powered opium and 90% alcohol, which was used for a wide-ranging assortment of ailments and diseases. "The Victorian Era had to be riddled with dope addicts who didn't realize that they were," said Morrell, who then described the lush, many-patterned, soft-surfaced interiors of Victorian homes. "Looking at period photographs, I can't believe how much they resemble opium dens!" Barbara added, "de Quincey had his opium addiction, and Sherlock Holmes had his own," which led Morrell to bring up Simmons' novel Drood because its main character, Wilkie Collins, was also addicted to laudanum. "Wilkie is the most unreliable character I'll ever have," Simmons said with a smile. "He was whacked out on laudanum most of the time. I loved him!" "Edgar Allan Poe loved Thomas de Quincey and saw him as a model," Morrell commented. "He imitated de Quincey's tone in 'The Fall of the House of Usher.' Poe is also credited with writing the first detective story. "It's also been documented that Conan Doyle wanted to improve upon Poe's detective story, and used Thomas de Quincey as the basis for one of his characters in a Sherlock Holmes story. I see this all as a continuum beginning with Thomas de Quincey." Simmons nodded. "My beloved Wilkie Collins' mother was a dear friend of Thomas de Quincey at a time when he had no friends. It all goes round and round. A web." "One of the things I find so interesting about the nineteenth century," Barbara Peters said, "is that up until laudanum, the most effective available pain relief was alcohol, but alcohol wasn't socially acceptable for women. Laudanum was acceptable. We've been talking about these men with their huge addictions, but there were many, many women who became addicted to laudanum." "Both of you have written books with plots based on real events," said Barbara. "David with the attempts on Queen Victoria's life, and Dan with the death of Clover Adams." Dan was inspired to write The Fifth Heart after reading a little book titled Five of Hearts. "I know a lot about Henry James," Morrell said, leaning towards Barbara. "I'm sorry!" Barbara exclaimed. "I exposed myself, and now I'm paying for it!" Morrell was a professor of American literature, and he's learned a lot about writing from Henry James. "James invented the third person limited point of view." Simmons jumped right in. "What Maisie Knew. The story begins from a five-year-old's point of view and then comes back to her at a different age. It's a masterpiece!" "I know a lot about Henry James," Morrell said, "but I can't even begin to fathom the amount of research you had to do for your book!" Simmons said, "I don't even call it research. I call it saturation reading. All reading of James is saturation reading. You can't read James lightly." "And we'll get off him in a second," Morrell said, leaning towards Barbara once again. Barbara laughed. "You're just punishing me!" "The Ambassadors is one of the most brilliant books I've ever read," Morrell continued. "Yes, and we'll fight anyone who says different," Simmons added. "We will! And James is coming here next week to sell books, right?" Morrell asked Peters. "I'm not taking you two out to dinner when this is over," Barbara said. "Or I'm going to drink!" which made everyone in the room laugh. 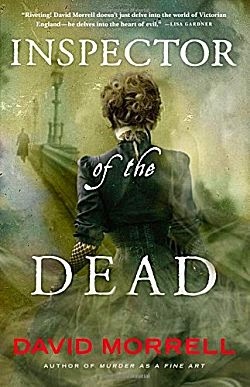 When Barbara mentioned that Morrell's Thomas de Quincey books take place during the Crimean War, Morrell told us that that war was England's equivalent of our Iraq War. "When war correspondents' dispatches from the Crimea came back describing the appalling conditions the troops were fighting in, it actually caused the government to collapse. There was no government for a week! "This is also going to be a trilogy. I'm already working on the third Thomas de Quincey book," Morrell said. "The three books take place within the span of twelve weeks." 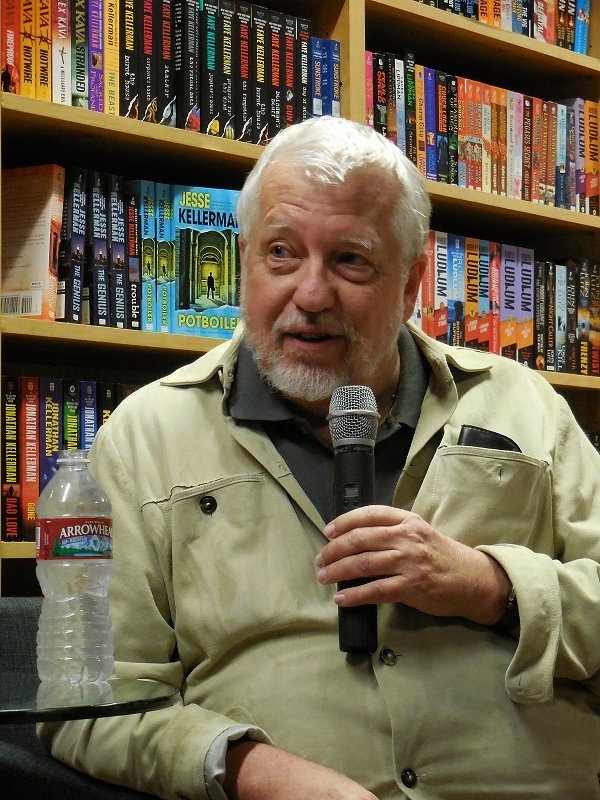 Dan Simmons looked at Morrell and asked, "If you can get three books in twelve weeks, why stop at a trilogy?" This remark met with a lot of approval throughout the bookstore. "I don't know. I'm writing slower now. My junk detector isn't letting me use things that I allowed in the past," Morrell replied. 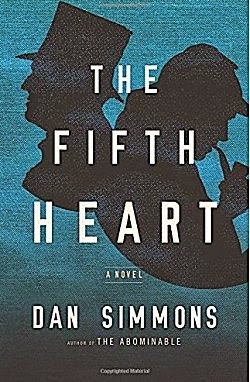 Shifting back to Simmons' The Fifth Heart, Simmons referred to Sherlock Holmes as a fictional character and Henry James as a "self-made fictional character-- Henry James created himself." Most people think of James being paired with Holmes, but Simmons sees it as Holmes being paired with James-- Sherlock being the lesser character. "Both are tremendous observers. Both are extremely secretive. I wanted to put them in a small space together. I didn't want them to be in their own milieu, so London was out. I brought them to America instead," Simmons said. "Sherlockians are going to murder me, but it's MY canon!" The Fifth Heart has shifting points of view. "It had to," Simmons told us. "James' great fear, after being with Holmes for a while, was that since Holmes was fictional, he was, too-- and that there was some 21st century hack out there writing about him and getting inside his head." Morrell smiled. "I did my dissertation on John Barth, and this has all the markings of a John Barth story." This led Barbara to ask the writers, "What is meta fiction?" "Meta fiction is literature about literature," Morrell replied. Peters then asked Simmons, "What's next?" "Omega Canyon," Dan answered. "It takes place during 1944-1945 at Los Alamos. An Austrian physicist is there working on the bomb when his wife and child are abducted, and he's being blackmailed." One of the fans wanted to know what Henry James novel was each writer's favorite. "The Portrait of a Lady is close to being the perfect novel for me," Simmons replied. For David it was The Wings of the Dove. Then he smiled and announced, "I think we sold a lot of Henry James novels tonight!" 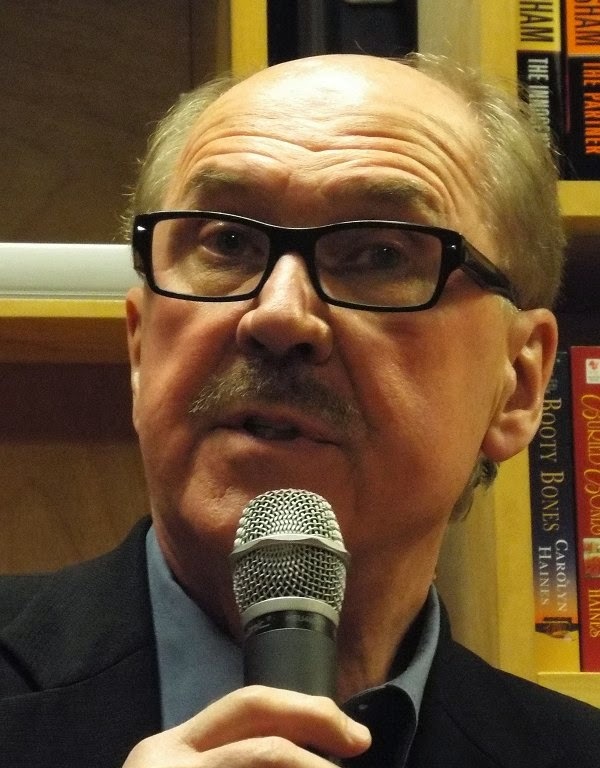 Another fan didn't have a question, but he did have something to say to David Morrell. 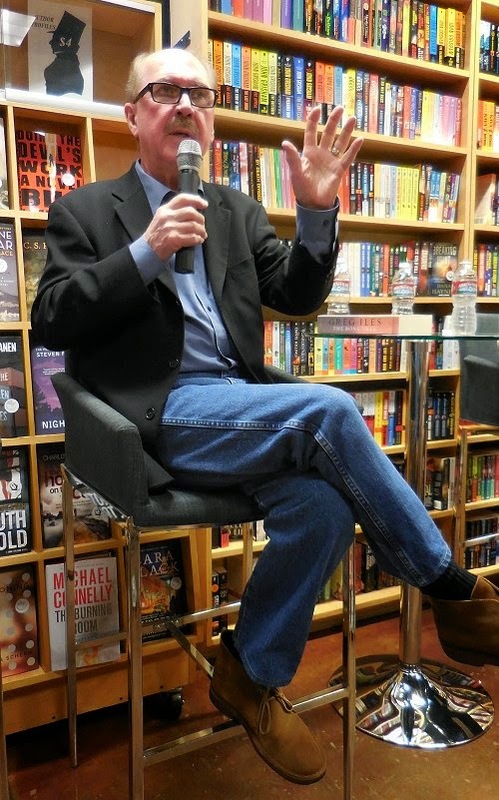 In 1972, this man was attending one of David Morrell's literature classes ("I got a B") and remembers Morrell telling the class, "I'm going to write a book some day." I for one am glad he did. For those of you who are interested in listening to and watching this event in its entirety, you can go to The Poisoned Pen's channel on Livestream. What a night! I've definitely become a fan of Morrell's Thomas de Quincey books, Margot! Omega Canyon sounds really intriguing - Los Alamos. Yay!! I don't remember reading Henry James' books, so I will not venture an opinion. He is one of Donna Leon's favorite writers and her character, Paola Falier, spouse of Guido Brunetti, is always quoting him or curling up with one of his books. Not so for me. This sounded like another terrific evening at the fabulous PP. I hesitate to ask if Barbara Peters was wearing any hand-made jewelry or clothing from abroad. 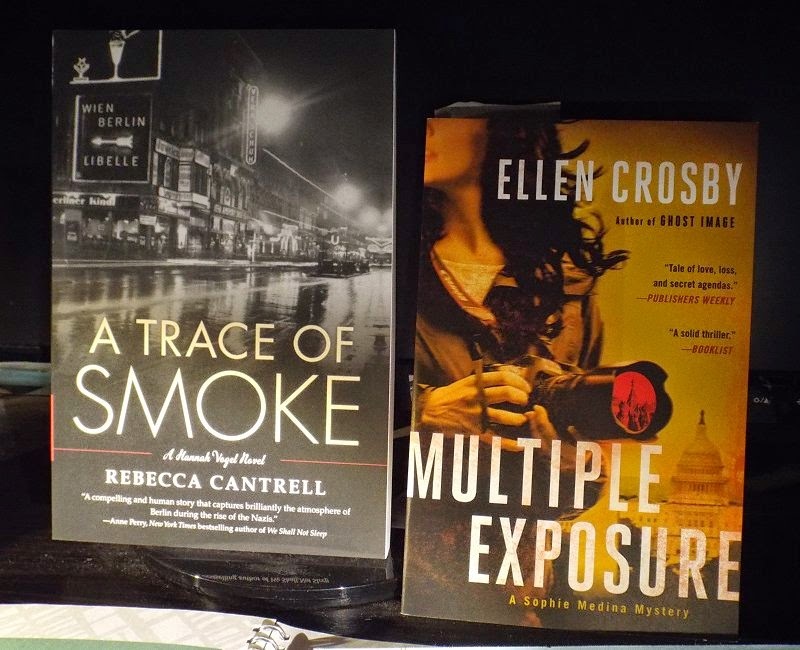 And I am interested in reading your review of "A Trace of Smoke" after you have read it. I have wanted to dig into this series, but I hesitate to read about WWII horrors. None that she mentioned, Kathy! Donna Leon, too. Ah well. He may have invented a few things that writers and teachers love him for now, but I still don't like reading his books. I keep hearing so many good things about Cantrell's series that I have to give it a try. I'm not sure when, though!